North Atlantic Books, 9781583948415, 984pp. 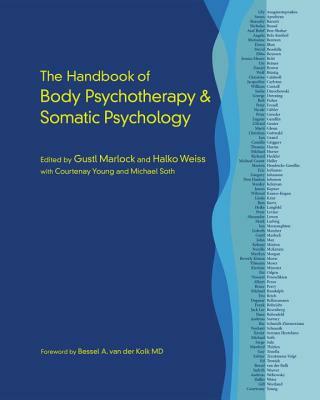 The Handbook of Body Psychotherapy and Somatic Psychology provides a comprehensive overview of body-centered psychotherapies, which stress the centrality of the body to overcoming psychological distress, trauma, and mental illness. Psychologists and therapists are increasingly incorporating these somatic or body-oriented therapies into their practices, making mind-body connections that enable them to provide better care for their clients. Designed as a standard text for somatic psychology courses, The Handbook of Body Psychotherapy and Somatic Psychology contains 100 cutting-edge essays and studies by respected professionals from around the world on such topics as the historical roots of Body Psychotherapy; the role of the body in developmental psychology; the therapeutic relationship in Body Psychotherapy; and much more, as well as helpful case studies and essays on the use of Body Psychotherapy for specific disorders. This anthology will be indispensible for students of clinical and counseling psychology, somatic psychology, and various forms of body-based therapy (including dance and movement therapies), and is also an essential reference work for most practicing psychotherapists, regardless of their therapeutic orientation. Contributors: Gustl Marlock, Halko Weiss, Courtenay Young, Michael Soth, Ulfried Geuter, Judyth O. Weaver, Wolf E. Büntig, Nicholas Bassal, Michael Coster Heller, Heike Langfeld, Dagmar Rellensmann, Don Hanlon Johnson, Christian Gottwald, Andreas Wehowsky, Gregory J. Johanson, David Boadella, Alexander Lowen, Ian J. Grand, Marilyn Morgan, Stanley Keleman, Eugene T. Gendlin, Marion N. Hendricks-Gendlin, Michael Harrer, Ian J. Grand, Marianne Bentzen, Andreas Sartory, George Downing, Andreas Wehowsky, Marti Glenn, Ed Tronick, Bruce Perry, Susan Aposhyan, Mark Ludwig, Ute-Christiane Bräuer, Ron Kurtz, Christine Caldwell, Albert Pesso, Michael Randolph, William F. Cornell, Richard A. Heckler, Gill Westland, Lisbeth Marcher, Erik Jarlnaes, Kirstine Münster, Tilmann Moser, Frank Röhricht, Ulfried Geuter, Norbert Schrauth, Ilse Schmidt-Zimmermann, Peter Geissler, Ebba Boyesen, Peter Freudl, James Kepner, Dawn Bhat, Jacqueline Carleton, Ian Macnaughton, Peter A. Levine, Stanley Keleman, Narelle McKenzie, Jack Lee Rosenberg, Beverly Kitaen Morse, Angela Belz-Knöferl, Lily Anagnostopoulou, William F. Cornell, Guy Tonella, Sasha Dmochowski, Asaf Rolef Ben-Shahar, Jacqueline A. Carleton, Manfred Thielen, Xavier Serrano Hortelano, Pat Ogden, Kekuni Minton, Thomas Harms, Nicole Gäbler, John May, Rob Fisher, Eva R. Reich, Judyth O. Weaver, Barnaby B. Barratt, Sabine Trautmann-Voigt, Wiltrud Krauss-Kogan, Ilana Rubenfeld, Camilla Griggers, Serge K. D. Sulz, Nossrat Peseschkian, Linda H. Krier, Jessica Moore Britt, and Daniel P. Brown. Gustl Marlock has nearly 30 years of experience as a psychotherapist; he is the director of a German training program in Unitive/Integrative Body Psychotherapy and a lecturer and supervisor for psychodynamic psychotherapy at the Wiesbaden Academy for Psychotherapy. Halko Weiss, PhD, is a clinical psychologist and lecturer for the University of Marburg and for the Bavarian Chamber of Psychotherapists. He is a cofounder of the Hakomi Institute in Boulder, Colorado. Courtenay Young was originally trained in Body Psychotherapy at the Gerda Boyesen Centre in London (1979­–1983) and also with David Boadella and others. He then moved to Scotland and was the resident psychotherapist for 17 years at the Findhorn Foundation, an international spiritual community. He has been both general secretary and president of the European Association of Body Psychotherapy (EABP) and was made an EABP Honorary Member in 2010; he is also a member of USABP; and, in 2011, he founded Body Psychotherapy Publications to produce a new series of edited books. He lives near Edinburgh in Scotland and works in both the National Health Service and privately, being registered as a psychotherapist with the UKCP and with EAP. The author and editor of several books, he was the lead writer on The EAP's Project to Establish the Professional Competencies of a European Psychotherapist (www.psychotherapy-competency.eu), and he is currently Editor of the International Journal of Psychotherapy (www.ijp.org.uk). Michael Soth is an integral-relational Body Psychotherapist, trainer, and supervisor (UKCP), with more than 20 years' experience in practicing and teaching from an integrative perspective. He was Training Director at the Chiron Centre for Body Psychotherapy from 1992 to 2010.